Hey – thanks for stopping by. It’s been awhile since I’ve upcycled a thrift store find. I’m going to show you three things I recently bought with the intention to upcycle but decided I would only change two of them. You will see what I mean and I’d love to know if you agree or would change it. First is this picture frame with spots for 8 photos. It has two picture hangers on the back so that you can hang it vertically as shown (the way I plan to use it) or horizontally. I bought it with the intention to use it as part of my cubicle makeover at the place I work when I’m not having fun vintage hunting or blogging. I will do a post when that makeover is complete. 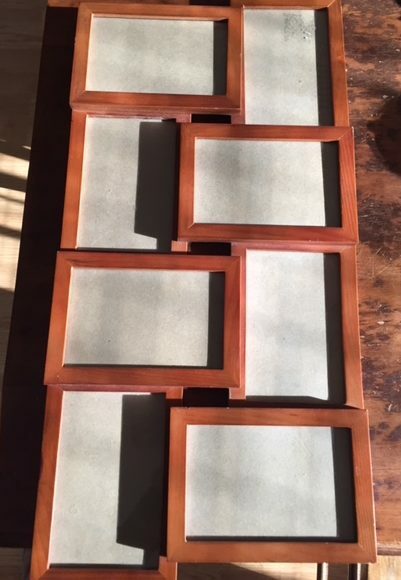 The picture frame is from Goodwill and was marked $3.50 but lucky me it had a green tag and it was green tag 50% off day – woohoo $1.75 – you just can’t beat the price. I wasn’t keen on the color so I decided to paint it. I used a latex Sherwin Williams color called Nantucket. Two coats and it was ready for the freshly cleaned glass and some photos…which I have not had printed off yet (next on the list). $3.99. The sign originally said Gypsy Girl, the sign was a nice light blue with black stenciled lettering. Of course I forgot to take a picture of the “before” because I got right into up-cycling this sign. I painted over the Gypsy Girl, which I actually thought was quite cute but I had other plans. If you are wondering what color it is, it’s the same as the picture frame but I watered it down and wiped some off as I was going. I got my Cricut machine out and designed this saying that will forever remind me of home. I love it, I love it, I absolutely love it!!! It reads 100,000 welcomes in Gaelic. Next is this cute metal covered candle holder. I scored it for $1.50 – Yippee. At first glance I thought I would spray paint it a nice vibrant color and use it on the patio. Then I took a closer look and fell in love with the little fairy like door. It has some rough spots and some wear marks but, ya know, I find them rather appealing. I think I am going to leave it as it is but add a solar light on the inside and hide it in among my outdoor flower plants and who knows maybe it will attract a fairy or two. I will do an update once I have it in place – of course I have to wait for Spring to arrive before I get to my outside projects and it’s pretty slow coming here in my part of the world. Would you change it or leave as is? Recycled (or not) thrift store finds are always A Wandaful Thing! 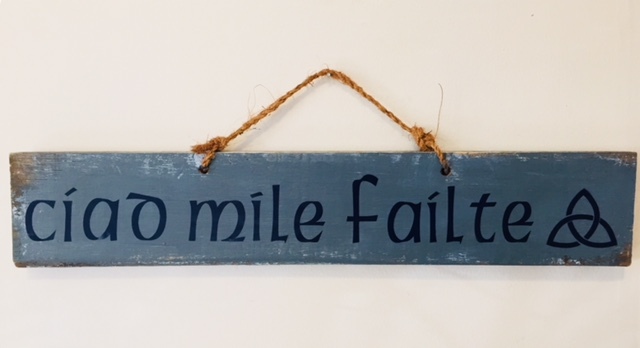 This entry was posted in Decorate, DIY and tagged barn wood sign, candle holder, cheap, Decorate, DIY, easy, fairy, find, ideas, inexpensive, metal, picture frame, sherwin williams paint, solar light, thrift, thrift store, upcycle. Bookmark the permalink. Great finds. Love the fairy door also and would be neat in the garden. Looking forward to more creative items. Love the color of the frame and the sign….beautiful! And what great bargains! You done good girl.